Suddenly. In. Love. With. ROCKS!!!!!! Pictured above, from the top: fluorite, blue calcite, citrine (but suspiciously looks like calcite and am contacting dealer about this), raw garnets (! 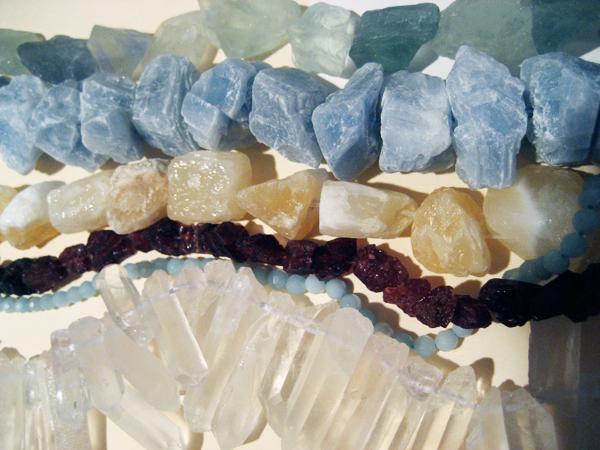 ), amazonite and quartz points. Gemstones are MUCH cheaper by the strand, and ebay is a good bet for locating best pricing. 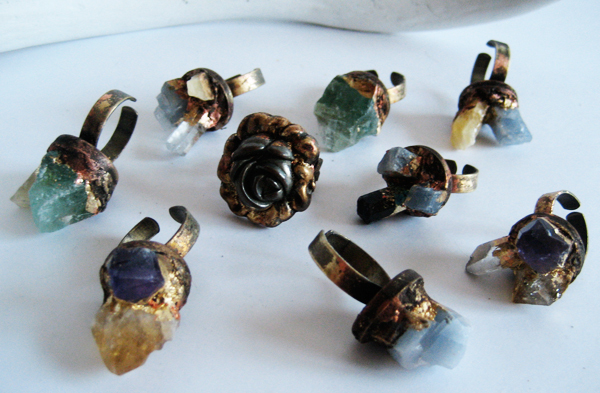 Big batch of Rocking Rings made yesterday, now being varnished to protect the gold leafing and patina work. As soon as they’re dry I’ll start listing. They are really and truly beautiful, if I do say so, and although chunky, very wearable. Earrings are coming next, can’t wait to play with these stones in that context. As always, larger photos up on flickr for your viewing pleasure.